If what you want is a more complete experience, this customized 120 minutes tour is now available, so you can visit both the great historical monuments and the most intimate corners of the wonderful city of Madrid. A truly recommendable, a very complete tour for an affordable price for 4 people. 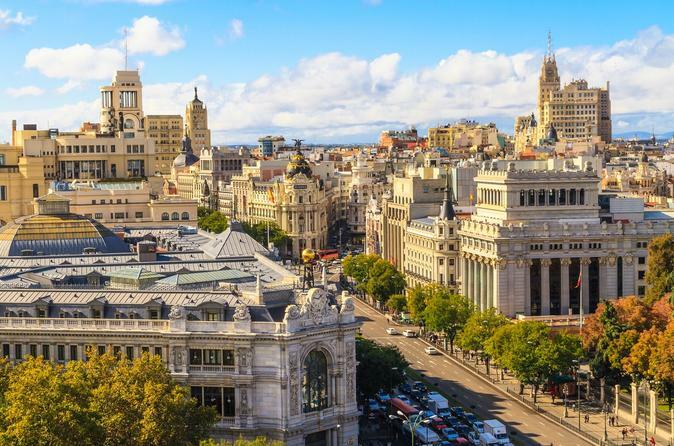 Cosmopolitan, historic and contemporary, this is Madrid, and on this tour, you will enjoy every facet of this vibrant city. If what you want is a more complete experience, this customized 120 minutes tour is now available, so you can visit both the great historical monuments and the most intimate corners of the wonderful city of Madrid. Your itinerary will consist of: Hortaleza, Plaza Dos de Maio, Gran Via, España Square, Debod Temple, Royal Palace, Opera (Royal Theatre), San Miguel Street, Vistillas View Point, El Paja Square, Barrio de las Letras, Neptuno, Paseo del Prado, Atocha Station, Retiro Park, Puerta de Alcalá, Cibeles Square, Colón Square. If you've never been in a tuk tuk, this is your chance! This new initiative of 100% sustainable electric transports aims to promote an image of environmental awareness in the city, without giving up tourist entertainment. This is a truly recommendable and complete tour for an affordable price for 4 people.